I was sitting there the other night thinking about what PNG does, that makes you better at something… And the first thing I thought about was …. driving. 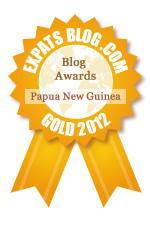 So how does being in PNG make you a better driver? 1. Your reactions are so much better! Ever had a car on the outside of a roundabout go right around it and in front of you? yup, that’s “surfing” the roundabout… How about being in the line of traffic, so you are driving and go to overtake when you realise there is a [insert vehicle here – truck, bus, van, car, 2 cars, truck and trailer, etc] parked in your lane, with rocks placed behind the tyres (presumably because the handbrake doesn’t work – nah – just cause you can) completely immobilised, and you have to instantly check to make sure you aren’t going to hit a car traveling at 120km/hr from behind you (yes the speed limit is 60km/hr) and “dodge” around the car on the road. 2. You can dodge potholes at any speed, including at night, after a couple beers, with someone driving towards you with highbeams on. 4. You can now drive through torrential monsoon rain where you can barely still see your car, let alone the car in front of you. 6. You don’t go anywhere without your license! 12. You can ring and drive (yes we know it’s dangerous! ), whilst dodging potholes and random abandoned cars. Sometimes text and drive, and on the old occasion email and drive (shock horror!). 14. You know how to use a horn, whilst dodging potholes, texting, dodging abandoned cars, and avoiding stray dogs that someone, somewhere will claim ownership of. 26. You have no issue sliding from lane to lane, at speed, whilst talking to someone on the phone and yelling at the kids to shaddup..
30. You recognise all your friends car’s, and know all of their number plates (so you can tell the guards to let them into your compound), you remember all their phone numbers too. 31. You see dead dogs on the road and you don’t flinch, waver or cause an accident. You slide the car past as if it wasn’t even in the way – without taking a breath. 35. You learn the international signs for: I don’t want any; piss off; come here; I’m watching you buddy; I’ll see you later; yes, its me, I live here; look at my sticker! 37. You know where to get air for tyres, and what fuel station doesn’t have water in the fuel problems.